The Suncast "Hawthorn" arbour's design complements any backyard or setting. No cutting necessary as all pieces are pre-cut and pre-drilled for easy assembly. The arbour is constructed from natural, sustainable cedar and is unfinished, ready to stain or paint to suit your taste. Hawthorn Cedar Arbour The Suncast "Hawthorn" arbour's design complements any backyard or setting. No cutting necessary as all pieces are pre-cut and pre-drilled for easy assembly. 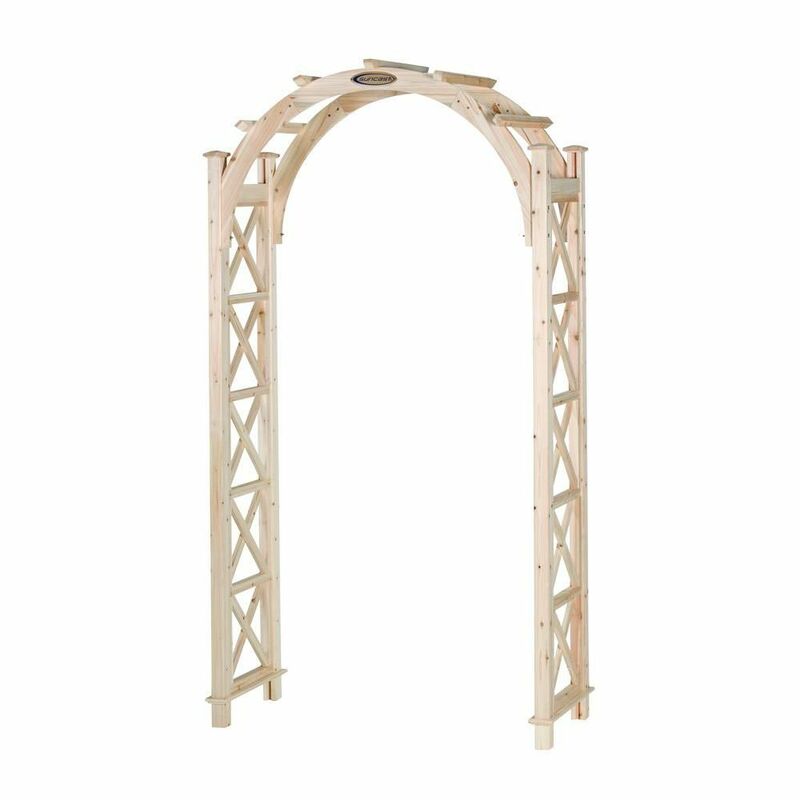 The arbour is constructed from natural, sustainable cedar and is unfinished, ready to stain or paint to suit your taste. Hawthorn Cedar Arbour is rated 2.3 out of 5 by 3. Rated 1 out of 5 by Mel from I ordered this arbor, thinking it was Cedar, as the name implies. Put it together, it was beautf... I ordered this arbor, thinking it was Cedar, as the name implies. Put it together, it was beautfiul. We tried to set it up today, and the curved part split immediately, then a cross bar on the bottom flew off when we were adjusting it. This is definately NOT cedar, and certainly wouldn't hold up long in outside weather conditions. The instruction manual doesn't even call it cedar, just "wood arbor". Home Depot took it back, but now I've lost time working with this one and get to start all over. Meanwhile my climatis is growing with no trellis! Rated 5 out of 5 by Mel from Home Depot was very prompt at shipping to our local store, and that store let me know right away ... Home Depot was very prompt at shipping to our local store, and that store let me know right away when it was in. This arbor is solid. Very well made. I look forward to years of enjoying this in my back yard. There is one small piece on the side that is split, so will take some caulking to secure, but that happens. Rated 1 out of 5 by A7nx from Poor design The assembly went smooth except when bolting the top to the side panels. Two bolts worked fine. The other two bolts were too short. While I realize the wood on the nut side of the connection was recessed to handle the short bolt, there was no way to hold the nut in place while the bolt was tightened. A less recessed hole and a longer bolt would have made for a better design. I noticed the floor model at a competitor had the same problem and it was very wobbly. When I contacted Suncast, they said: Unfortunately the only bolts that come with that model are the only bolts available for that particular model. You can purchase any bolts that you think are necessary, but if any damage were to occur due to new bolts being placed in rather than the bolts given the warranty may be at risk. So, poor design, did not (initially) offer an apology, unwilling to make it right, didn't want feedback on how to improve the design, and said the warranty may not be honored if I used bolts that fit the design. Very poor customer service.